Rabbi Shimon Cowen is the founding director of the Institute of Judaism and Civilisation. The problem with the anti-bullying program is not the laudable goal of preventing homophobia, but the overall strategy which promotes homosexuality as a “norm”, according to Rabbi Dr Shimon Cowen. BECAUSE every human being has a soul made in the image of its Creator, every human being should be loved and his or her best potential sought and helped into actuality. This love is the real source and meaning of tolerance. The false meaning of tolerance is moral relativism, with its argument that I must respect another’s practice because who knows what the truth is – maybe s/he has it and not I? The human soul and human tradition resonate over time with a set of universal norms, one of which is the heterosexual union of man and woman. As with all norms, there are impulses in the human being which fight this norm,sometimes overpoweringly. We can struggle with it, sometimes people cannot even struggle with it, and this can be viewed with much compassion. Still the indulgence of the homosexual impulse was prohibited by the Creator and the small mirror of the Creator, the human soul, where in use knows it.where the soul has been submerged – as in so much contemporary culture – to become aware of the soul, of tradition, of what is required of a person by his or her Creator – all that requires a discussion. Creator wants of us with it, and how to deal with difficulties along the way. 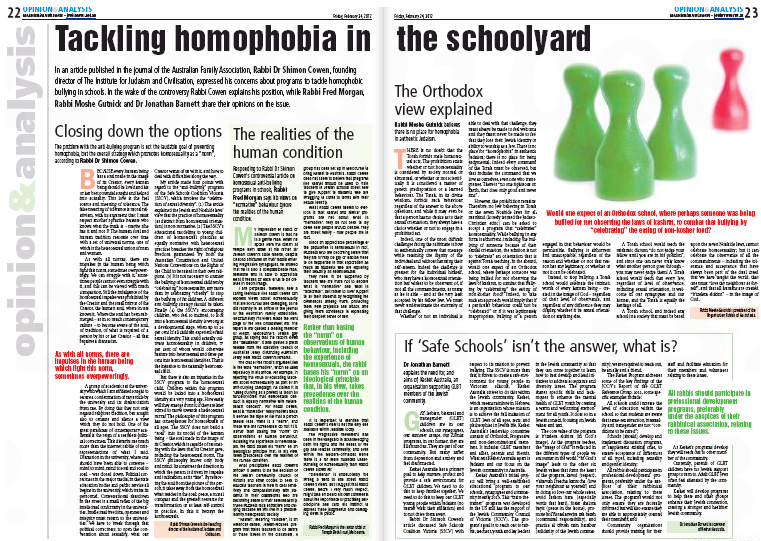 My article made four points with regard to the “anti-bullying” program of the Safe Schools Coalition Victoria (SSCV), which involves the “celebration of sexual diversity”. (1) The article explained the Jewish and Noahide laws’ view that the practice of homosexuality (as distinct from homosexual orientation) is non-normative. (2) The SSCV’S educational modelling to young children of homosexual practices as equally normative with heterosexual practices breaches the right of religious freedom guaranteed by both the Australian Constitution and United Nations Conventions on the Rights of the Child to be raised in their own religions. (3) It is not necessary to counter the bullying of homosexual children by “celebrating” homosexuality, any more than by celebrating “obesity” to stop the bullying of fat children. A different anti-bullying strategy should be taken. Finally (4) the SSCV’S encouraging children, who feel so inclined, to lock into a homosexual identity is wrong at a developmental stage, when up to 26 per cent of all children experience fluid sexual identity. This could actually cultivate homosexuality in children, 97 per cent of whom would otherwise mature into heterosexual and three per cent into homosexual identities. That is the injustice to the naturally heterosexual child. But there is also an injustice in the SSCV program to the homosexual child. Children within this program would be locked into a homosexual identity at a very young age. How easily will they emerge from it,if they are later stirred to move towards a heterosexual norm? The philosophy of this program has consequences for homosexuals of all ages. The SSCV does not build a “soul” into its model of the human being – the soul made in the image of its Creator, which is capable of resonating with the laws that its Creator gave, including the heterosexual norm. The SSCV philosophy knows only body and mind.its construes the direction in which the person is driven by impulse and inclination, as its “fate”. By removing the soul from the picture of the person, it takes away from the homosexual what resides in the soul: peace, a moral compass and the greatest resource for transformation or at least self-control in practice. In this it betrays the homosexuals. This entry was posted in GLBTIQ, Health/Welfare, Jewish, Youth and tagged Australian Jewish News, Bullying, Gay, GLBTIQ, Homophobia, Jewish, Lesbian, Rabbi Dr Shimon Cowen, Safe Schools Coalition Victoria. Bookmark the permalink.